Fantastic One Bedroom Apartment!!! If you’re looking for a secluded place to enjoy your morning cup of coffee, look no further than your private deck, that sets outside of your parlor floor kitchen/living room. This Luxurious, Newly Renovated Apartment is the ideal place for your visit whether it is for business or for a self-rejuvenating get away. This Fantastic modern 1 bedroom, 1 bath designer styled abode features a Queen Size Bed in the Bedroom (equipped with 55" TV), 55" TV (Living Room) Cable, Phone, Wi-Fi, along with a Sonos entertainment system to enjoy the sounds of your favorite artists via Spotify or Pandora. PLEASE DO NOT BOTHER IF YOU'RE NOT 25 YEARS OF AGE OR OLDER, YOU MUST BE 25 YEARS OLD TO BOOK THIS APARTMENT SO PLEASE DO NOT INSTANT BOOK IT WILL BE CANCELLED. The kitchen has a full range of stainless steel appliances which includes a stove, refrigerator, microwave, and dishwasher. The kitchen is additionally supplied with pots and pans, dishes, bowls, silverware, in addition to a Keurig coffee maker (coffee complimentary), toaster, and blender. This Home Away from Home can sleep two people comfortable and up to three with a Air Mattress Queen Size bed that's provided, if necessary. 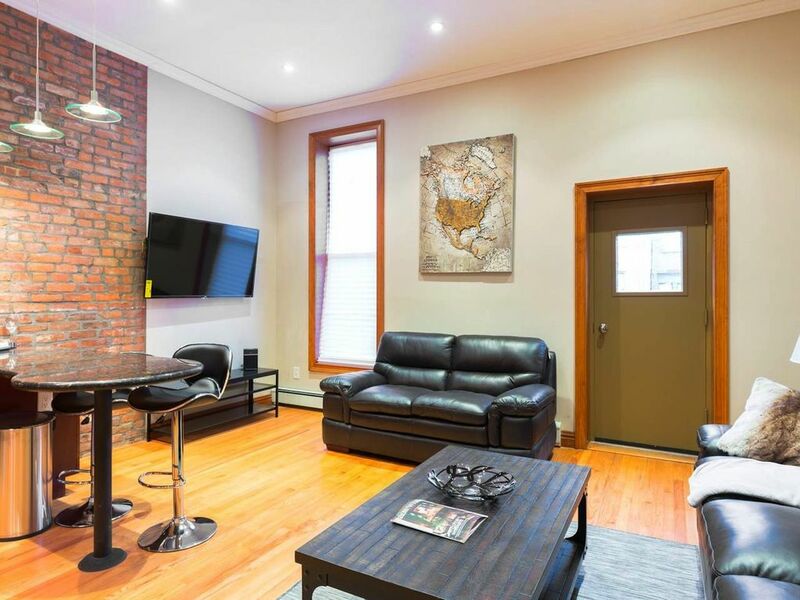 Located in the City of Dreams nestled on a nice, block in Brooklyn you Will not be disappointed. So Come, Enjoy, Relax and Unwind. Close to Transportation and Restaurants. Two short blocks from the express A train to Manhattan. Come relax and enjoy your stay. Whether you're in town for pleasure or work, this humble abode accommodates all. Everything is here!!. Do not hesitate to contact me with any other questions or concerns. had a nice stay with kids, enjoyed the Atari and Netflix and equipped kitchen. Great place for a great value! The train station is right around the corner, there is good coffee close by, and there's a 24 hour market right around the corner if you need some essentials or a late night sandwich. It's also very secure with three locking doors to your stay. Highly recommended! This one bedroom apartment was clean and had everything needed for a comfortable stay. The fully furnished living room has a large TV and and comfy leather seating. The apartment has a full sized refrigerator, stove, microwave, Keurig and a fully stocked kitchen. The location is close to buses, taxis, etc. The owner was VERY responsive to queries and remained in touch with us throughout our stay. We will book this apt for our next visit to NYC. I enjoyed my stay at this apartment. It was cozy, super clean, and modern. Harvin was very nice and made sure everything was in order for us. Perfect place to wind down and relax. The furniture was comfortable and modern. Also has a private little balcony which was a plus. Really recommend this place for a nice quiet getaway. Will definetly be booking here again. Convenient location. Clean, nicely appointed, reasonable price. It was just what we were looking for, to enjoy a few days exploring Christmas season in Manhattan. I would definitely recommend.